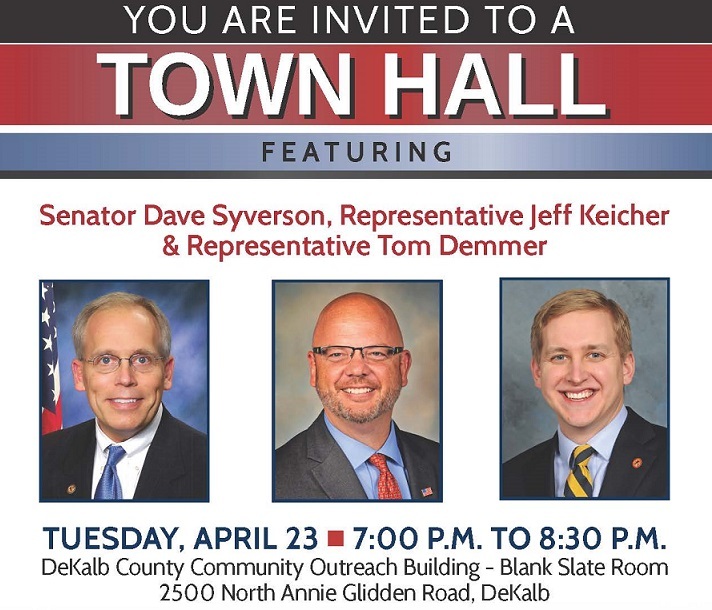 Area residents are invited to attend a Town Hall Meeting on the Illinois state budget that will be held from 7:00 p.m. – 8:30 p.m. on Tuesday, April 23 at the DeKalb County Community Outreach Building, located at 2500 North Annie Glidden Road in DeKalb. The event will be hosted by State Senator Dave Syverson (R-Rockford), State Representative Jeff Keicher (R-Sycamore), and State Representative Tom Demmer (R-Dixon). For questions or more information, please contact Representative Demmer’s office at (815) 561-3690 or visit tomdemmer.com.